The Halloween Costume contest at our work is big, and very competitive! Each year I try to go all out because 1st prize gets a free day off (and 2nd place gets a free half day off) Who wouldn’t want that!? The previous years I came as Paul Stanley, Starchild from KISS, and Ronald McDonald. 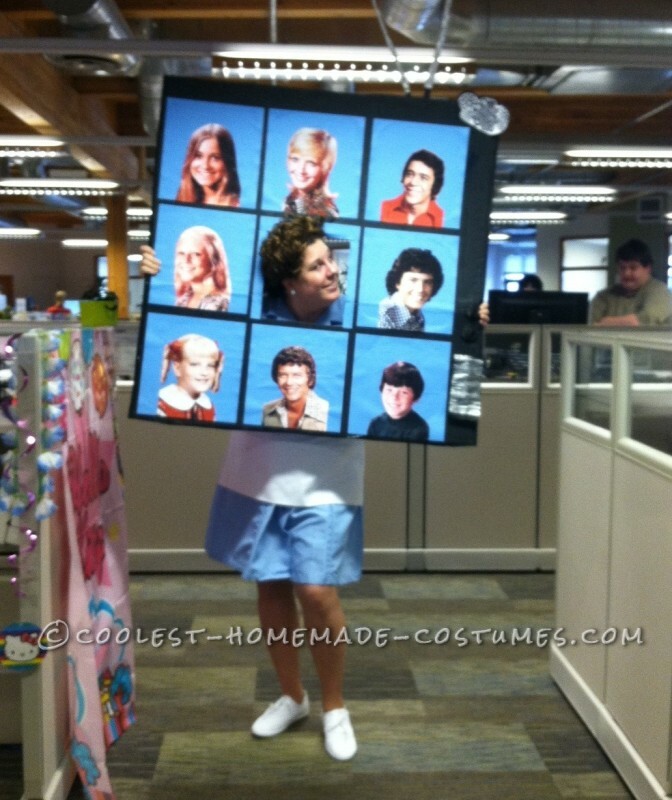 This year I decided to be Alice from the Brady Bunch. I loved watching that show growing up so I was super excited when I came up with the idea. I bought the wig, shoes, apron and blue dress on eBay. The board is where I had to get creative! 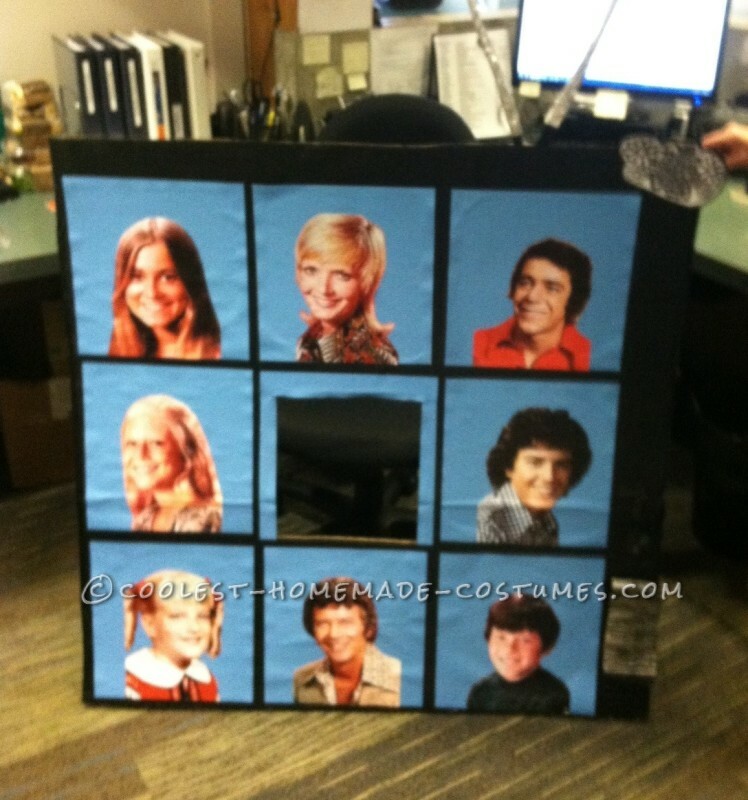 I decided to have it look like a TV and then the Brady Bunch squares inside of it. I took a piece of cardboard from work and then painted it all black (this was probably the easiest step haha!). Then I found Brady Bunch blue squares of paper at the craft store. I printed each Brady family member out at work (free!) and then cut and pasted them in each square. The hard part of this step was making sure the squares were spaced evenly apart. Once I completed that, I cut out a square for my head to poke through. Then I put blue strips of paper around the square so it looked like I had a blue background like the rest of the bunch! After that, I wanted to make TV buttons (you cant really see them in the picture because they are black) I cut two circles out of cardboard and then then two small rectangles, and painted it all black and once they dried I glued them together. I then took a silver pen and wrote chanels on one and volume on the other. For the speaker of the tv, I covered a rectangle piece of cardboard with aluminum foil and then glued it to the board. Then I cut a bunch of thin black strips and glued it to that. For the TV antennas I cut two long thin pieces of cardboard and covered those in aluminum foil. At the top I shaped it into a little ball. Then duct-taped those to the back of the board. It probably took me a good four hours total to make the board. Halloween day I got so many compliments, so the time and effort I put into this was definitely worth it! I ended up placing 2nd, but only because my co worker dressed up as our boss which was hilarious. Anyways, thanks for reading! I hope you enjoy my costume as much as my coworkers and I did!